Tokyo’s 14 million inhabitants live in easily one of the coolest cities in the world. But it’s not without risks; such as earthquakes, Godzilla attack, and common fire. Tokyo’s incredible population density, congested streets, and narrow roadways mean that to combat the effects of the above American or even European-sized fire trucks would be much too large. 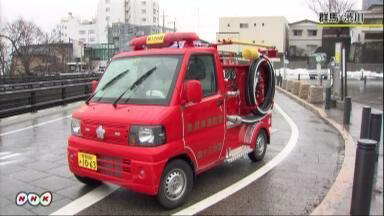 Toyko’s fire department therefore use a range of smaller vehicles that are better able to navigate the city (with even converted kei cars deployed in some districts), such as this Isuzu pumper. This superbly detailed recreation of a common Japanese fire truck comes from Flickr’s Ralph Savelsberg (aka Mad Physicist), and follows his excellent Toyota HiMedic ambulance that appeared here a few weeks ago. With accurate fire fighting apparatus (including a hand-drawn cart used for Tokyo’s narrowest alleyways), opening doors and hatches, and even a pair of brick-built fire-fighters there’s plenty more to see – click here to check out all the imagery via Ralph’s photostream. Ok, this might be digital, but it’s too cool not to post! This is a GT4586. What’s that you ask? The 4.5 litre V8 engine from a Ferrari 458 fitted inside the engine bay (mostly) of a Toyota GT86. The result is one hell of a drift car, and it’s street legal too, as builder/racer Ryan Tuerck demonstrates in this rather excellent video. Sadly the real car is no more following an accident, but TLCB favourite Simon Przepiorka has brought the Toyrari/Feryota back to life in Lego form with this awesome-looking render. Make the jump to see more via the link! OK, a cayman isn’t quite an alligator, but they are both green. Or something. Anyway, here’s a most excellent Porsche Cayman R in a retena-searing lime green, and it looks the business. Built by TLCB regular Simon Przepiorka (who is due here tomorrow too with something very cool) it’s a superb recreation of Porsche’s fastest mid-engined coupe, which is no easy feat given the shape of the real car. Cunning techniques abound and there’s more to see on Flickr via the link above. This lovely land Rover Series 2A pick-up comes from November Juliett of Flickr, who has captured the classic 4×4 beautifully in small-scale Lego form. It’s even got suspension. Head to November’s Land Rover Flickr album via the link above to see more.